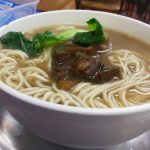 The whole business of “Tibet Photography” might have started out as a commercial swindle (of a mild kind) according to Dr. Claire Harris of Oxford. 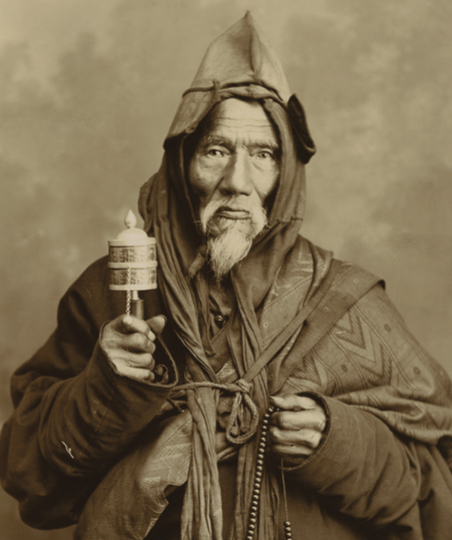 Tibet’s inaccessibility to foreigners did not deter certain Victorian photographers from creating exotic “fabrications of the fabled land” in neighboring Darjeeling and even making picture-postcards of such images available to English visitors to that famous hill station” –– along with, of course, such “native curios” as prayer-wheels, skull-bowls and ghost daggers (phurba) that even Kipling mentions being sold at Simla, way back when. 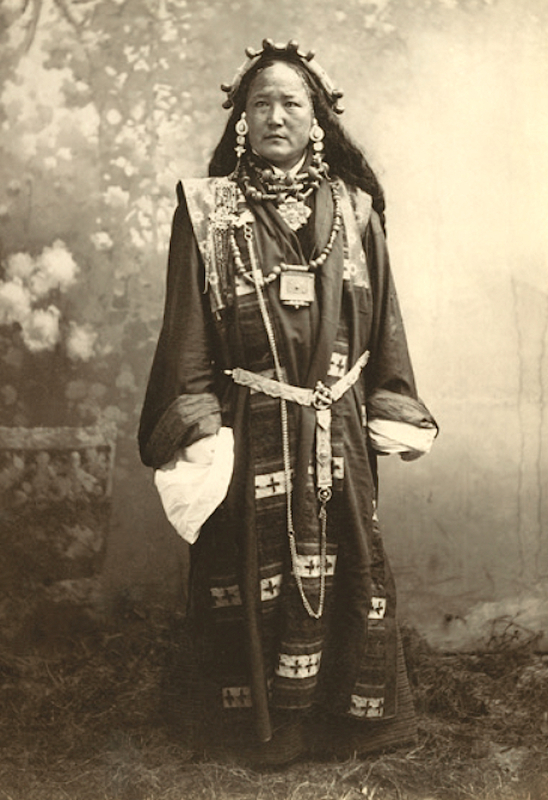 Such exotic photographs and postcards of “Thibetan Woman” on sale at the studios of Johnston & Hoffman and Thomas Paar in Darjeeling were innocent enough but some images definitely drifted into the area of fabrication, as when a senior lama and founder of the Yiga Choling monastery at Ghoom was dressed up as a roving mendicant (holding a souvenir prayer-wheel) and labeled “Lama”. 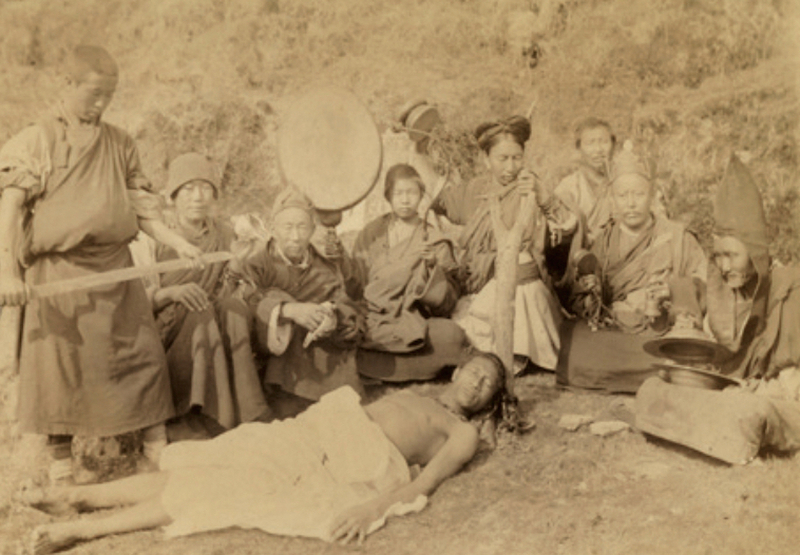 Then we get to unapologetically outright posed photographs claiming to be scenes of life in Tibet: a marriage ceremony, a religious service, picnickers dancing, a bandit waylaying a merchant and even a funeral scene – minus vultures but complete with an obligingly supine corpse, a sword wielding “dismemberer” and monks with drums, cymbals, bells, etc., performing funerary rites. 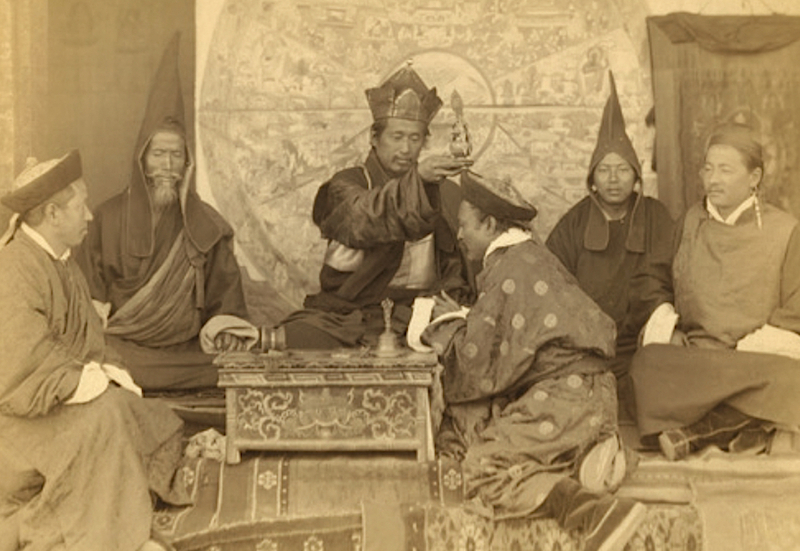 Tibetan Religious Service, Sarat Chandra Das. Note Sherab Gyatso at rear left. 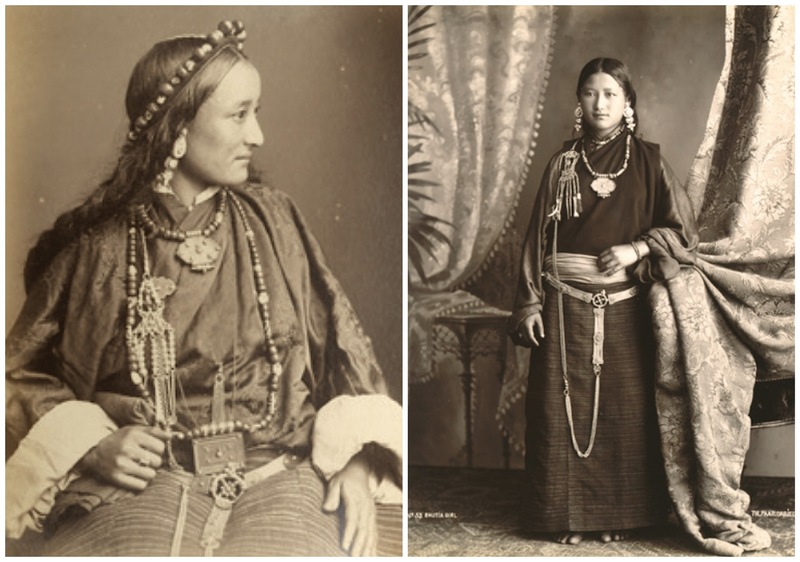 Nearly all these posed photographs were taken by the great Indian scholar/spy Sarat Chandra Das to illustrate his book Journey to Lhasa and Central Tibet (1904). 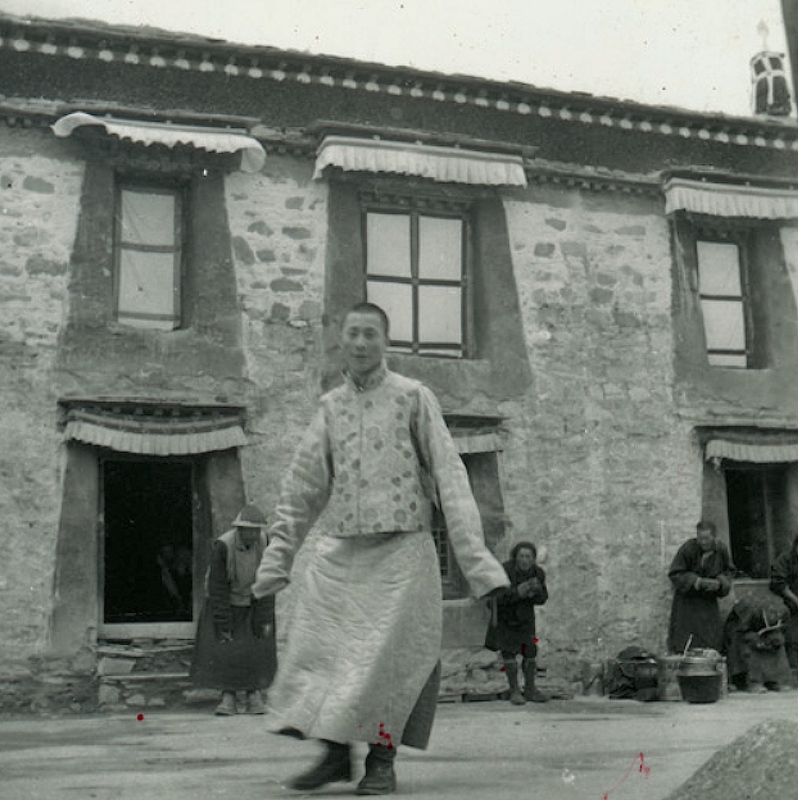 As Das was in Tibet covertly he could not, of course, have gone around snapping pictures of actual Tibetan life. But our enterprising “pundit” did what was required of him (by his publishers) when he got back to Darjeeling with his bhootia friends. 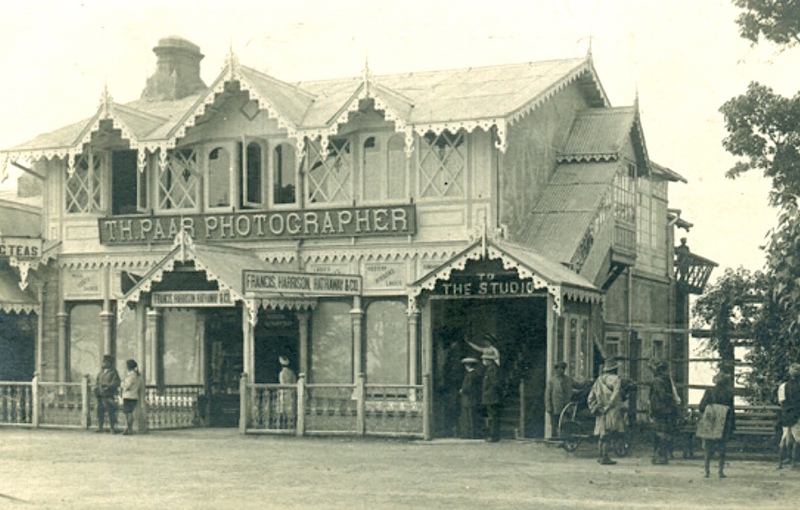 These images also possibly ended up in the lucrative picture-postcard market of Indian hill stations. 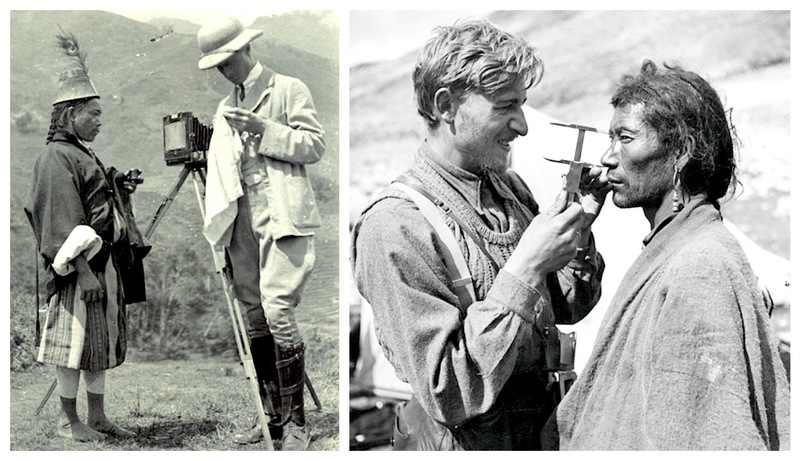 Left: Charles Bell and his orderly/assistant photographer, Rabten Lepcha (Edith Kerr 1913). Right: Bruno Beger measuring a Tibetan head (Schäfer Expedition 1938). The book’s sub-section on photographic skullduggery in Darjeeling is merely the tip of the iceberg for Dr. Harris’s substantial and fascinating study. 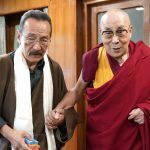 I think I could say that thus far PHOTOGRAPHY AND TIBET is possibly the most detailed investigative study on this subject. 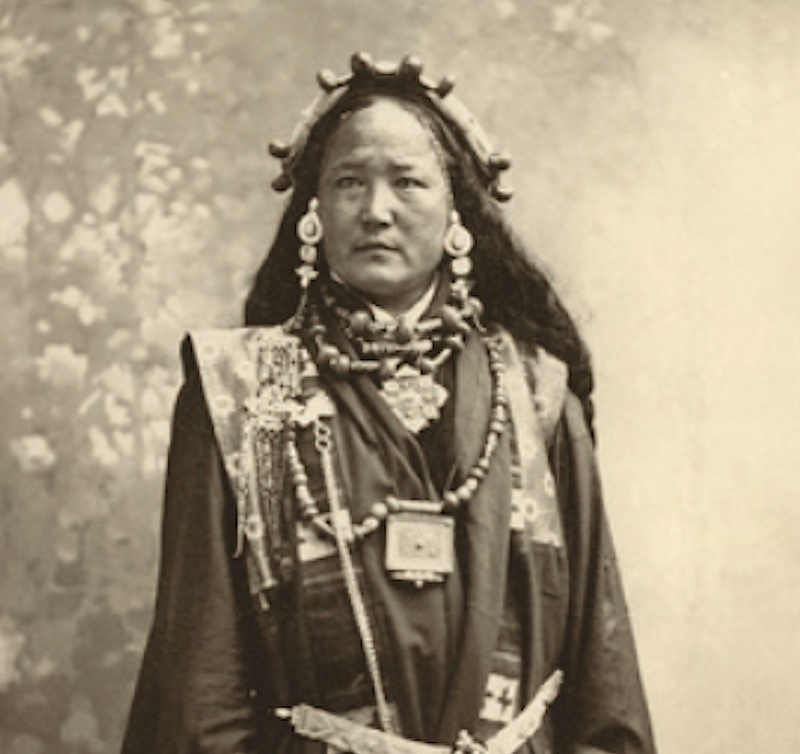 For instance she provides us numerous accounts and documentation not only of the travels but also photographs taken and equipment used by the long caravan of British colonial officials, Army officers, French and Swedish explorers, “pundit” spies, American missionaries, German ethnographers, Italian anthropologists, self-styled New York mystics, and all the other visitors to Tibet from the mid 1800s to the present day. Clare Harris does not seem to have missed out a single photographer of note who ever crossed the Nathu La. 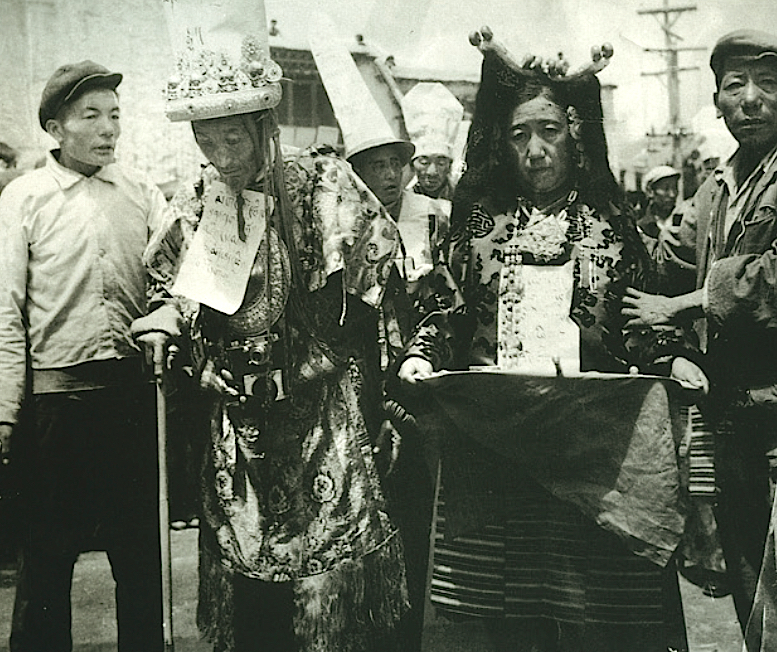 Alexandra David-Néel in disguise before the Potala (center), Lama Yongden (left). 1924. Gelatin silver print. She does not of course overlook such intrepid women travelers and photographers as the renowned Alexandra David-Neel, but Dr. Harris also discusses the work of the Parsi artist and photographer, Li Gotami (wife of Anagarika Govinda) who from 1947 to 1949, recorded a whole series of black & white images of Tibet from the chapels of the amazing Kumbum Temple in Gyangtse all the way to the canyons of Tsaprang and the ancient monastic complex of Tholing in Western Tibet. Li Gotami’s photographs were published in Tibet in Pictures (1979). I own a copy of this slim book which I regard as an infinitely precious repository of visual memories of a bygone age. Tholing Monastery, Li Gotami 1948. This historic monastery complex (997 AD) was destroyed by Communist China in 1969. Clare Harris somehow obtained rare copies of tentative photographs taken by the Panchen Lama in 1905, and even a glass plate reproduction of the image below – ‘photographed, processed and developed by the (13th) Dalai Lama himself,’ in 1912. 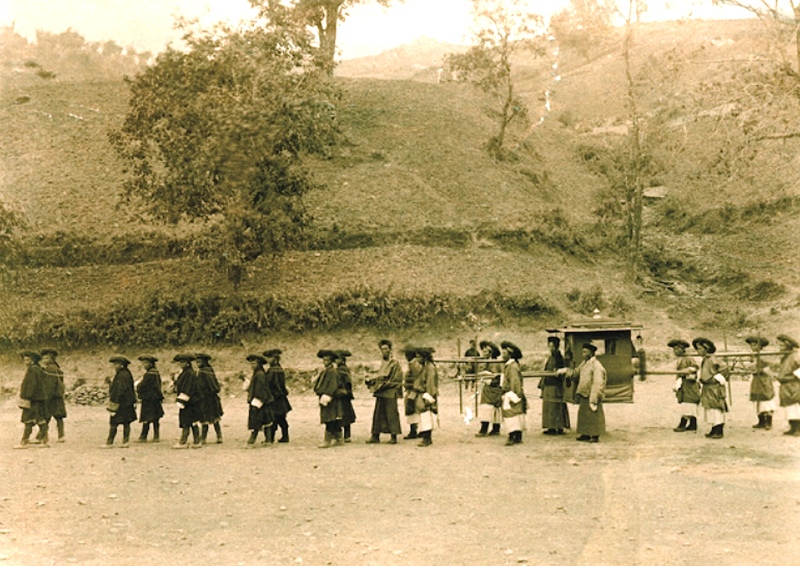 The 13th Dalai Lama’s staff with his palanquin, captioned in Bell’s handwriting, ‘photographed, processed and developed by the DL [Dalai Lama] himself,’ probably taken in Kalimpong in 1912, from the collection of prints belonging to Charles Bell. Demo Rimpoche and his consort being struggled during the Cultural Revolution in Lhasa. Note the Leica camera hanging from Rimpoche’s neck. Unfortunately, Dr. Harris did not obtain any sample of His Holiness’s work, which is a pity. The reader will have to be content with this charming photograph of the young Dalai Lama taken by the Tibetan/Sikkimese photographer Tseten Tashi (who had a photo-studio in Gangtok) in 1959. His Holiness is having a nice stroll down a street, probably in Dromo (Yatung) while bystanders keep a respectful distance in the background. 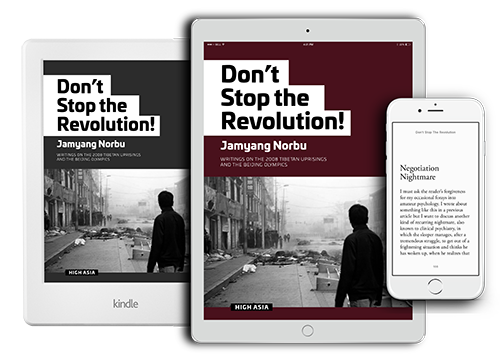 The book does not overlook present-day Tibetan photographers both in exile and also in occupied Tibet. We are provided analysis and examples of the works of the fashion photographer Tenzing Dakpa (Bylakuppe), the skilled but self-taught itinerant photographer Jigme Namdol (McLeod Ganj), the “talented young innovator” Nyema Droma (London) and the painter turned photographer Tsewang Tashi (Lhasa) . 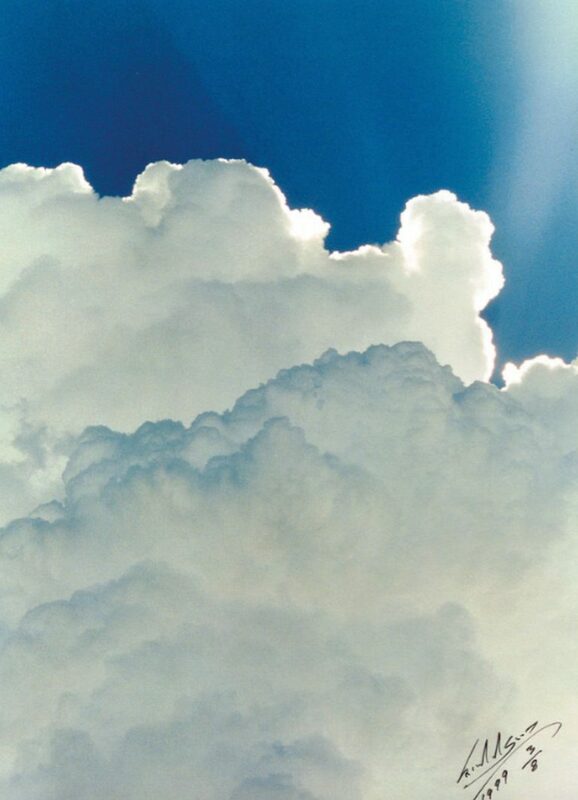 Dr. Harris also informs us that the 17th Karmapa is an accomplished photographer but provides us a meditative sky study by Tai Situ Rimpoche. “Tibet Couple” Gerong Phuntsok & Dawa Drolma, CNN. 2015. 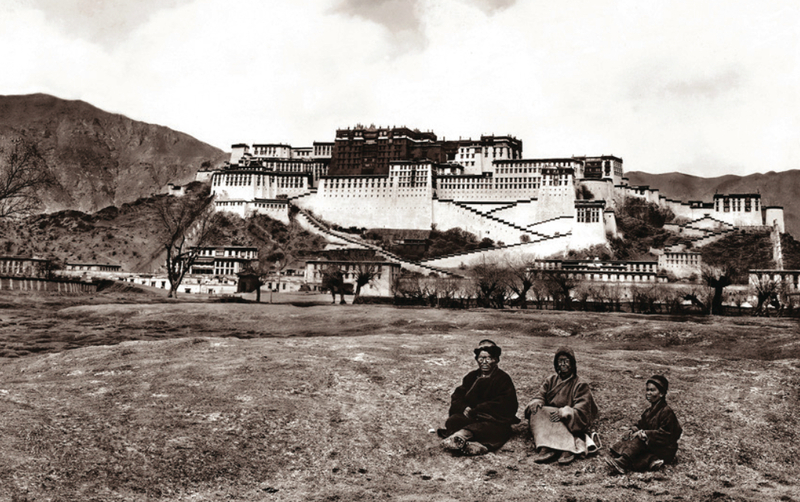 Photography and Tibet is a richly informative and a hugely entertaining read. 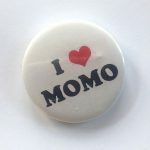 Professor Harris does, ocassionally, lapse into academese “… bodily praxis of proxemics and empowerment” etc., but these are forgivably few and far between. The bottom line –– for anyone with a passion for photography or Tibet, ideally both, this is an absolute must-have book.